Since the mid-1980s Yvonne has maintained a registered NWF backyard wildlife habitat where a variety of birds, insects and frogs abound. A gorgeous male is alert for danger. All bird watchers and most children recognize the male Northern Cardinal, a Christmas symbol, but many people know nothing about its nesting and courtship habits. Through the years, we have been able to observe and photograph most of the mating behavior of our beautiful Northern Cardinal. Here, we hope to give you some insight into what happens in a Cardinal's nest. Besides telling you how to attract this lovely bird into your own backyard with plants, bird feeders, and bird baths, we suggest some good books about Cardinals. 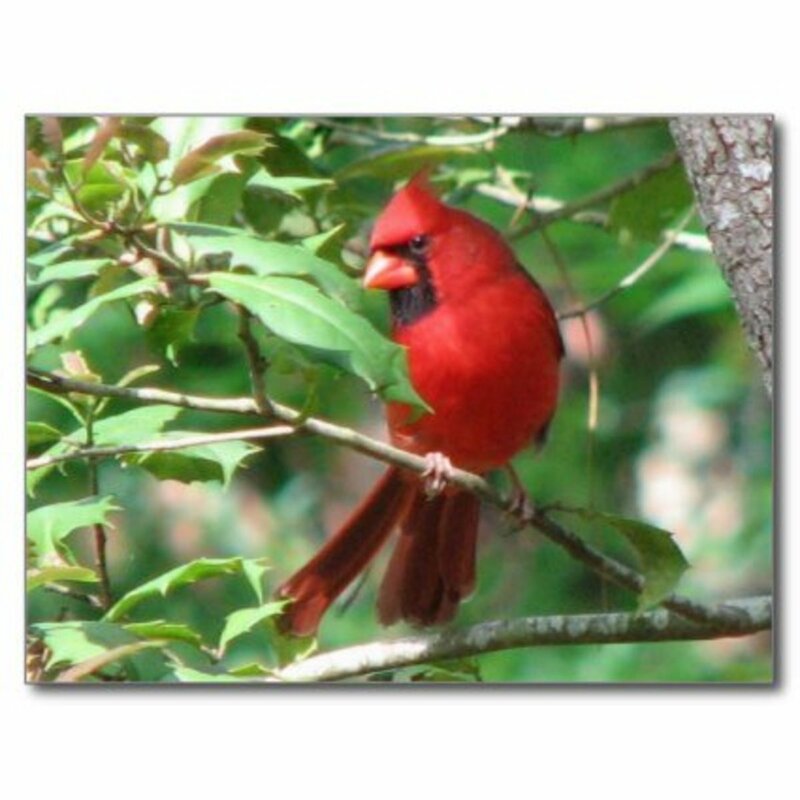 For those who want to test their knowledge of the lovely bird, there is a Northern Cardinal quiz. All these Cardinal photos are copyright by Y.L. Bordelon, all rights reserved, unless otherwise noted. Many of these photos are available in my Naturegirl7 Zazzle Shop. Northern Cardinals (Cardinalis cardinalis) were called "Redbirds" where I grew up. The Northern Cardinal is also known as the Virginia nightingale. It is a Christmas symbol and ranges from southern Canada south to northern Guatemala and Belize. It inhabits forest edges, thickets, gardens, backyards, shrubby areas, and orchards. The bright red male Cardinal is so beautiful and has such a lovely song that it was once trapped and sold as a caged song bird. This practice was banned in the United States by the Migratory Bird Treaty Act of 1918. 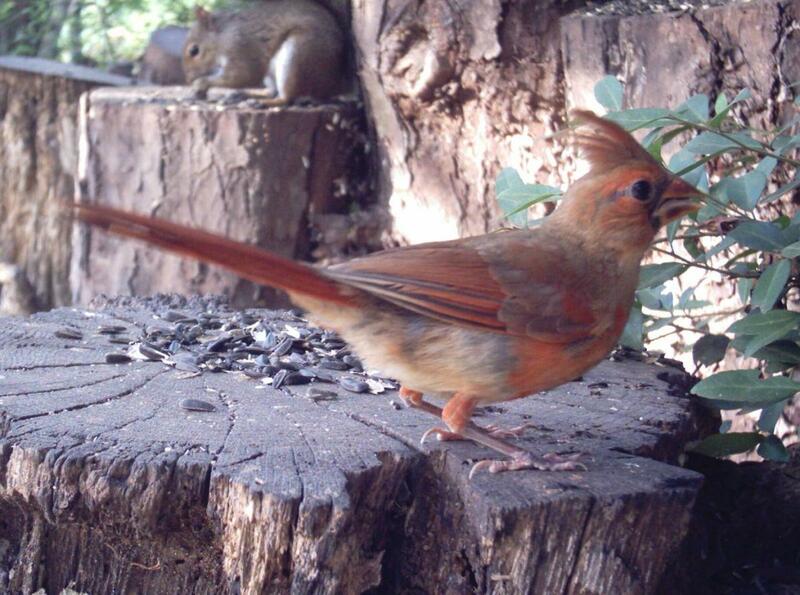 Listen to the song of the Northern Cardinal from the National Park Service. 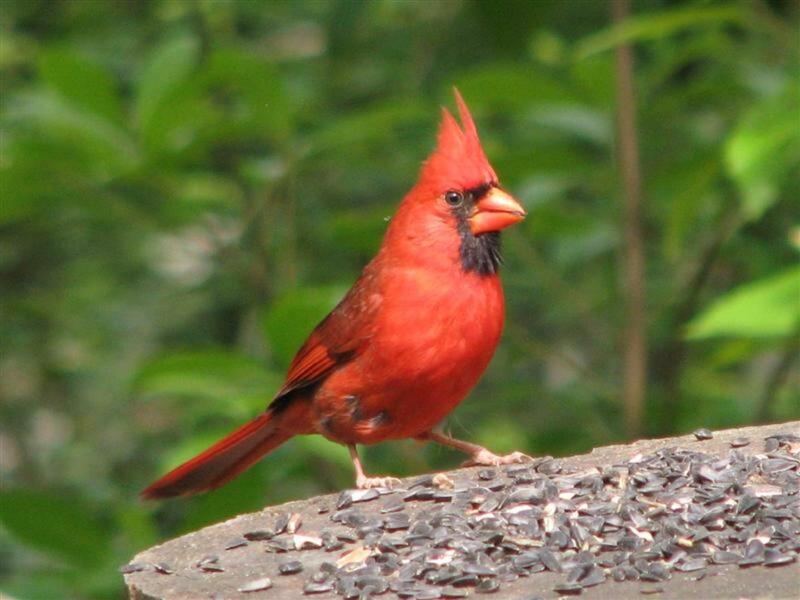 Cardinals are medium-sized birds measuring 8.3 to 9 inches. The male's crest, black mask, and bright orange beak set him apart from other birds. The more demure females are not as colorful, but are beautiful in their own right with their feathers of tan, brown, and touches of red. 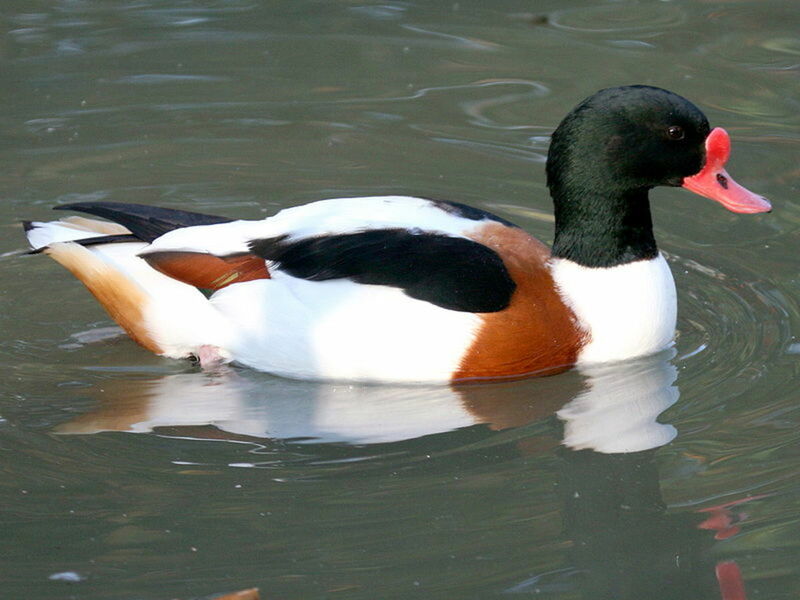 Their beaks are also orange. Young birds have dark beaks until their first molt. Males are territorial during the breeding season and can be seen and heard singing from a prominent spot in their territory. During courtship, the male feeds seeds to the female. She will often flutter her wings and beg like a chick. After the courtship is over, the female builds a nest of twigs, vines, some leaves, bark strips, grasses, weed stalks, and rootlets, and lines it with fine grasses. She builds it in a thorny bush, thicket, or bramble, or in a dense shrub or tree. Up to six days later, she begins laying eggs, up to three or four total. They are somewhat glossy, grayish, bluish, or greenish-white, and spotted or blotched with brown, gray, or purple. The female incubates the eggs for 11 to 13 days. A couple normally raises two to three broods each year. When they hatch out, the chicks are blind and helpless, and their bodies are covered only by a little fuzz. But they grow quickly. The chicks fledge in 7-13 days, but the male continues to feed the fledglings while the female builds a second nest. 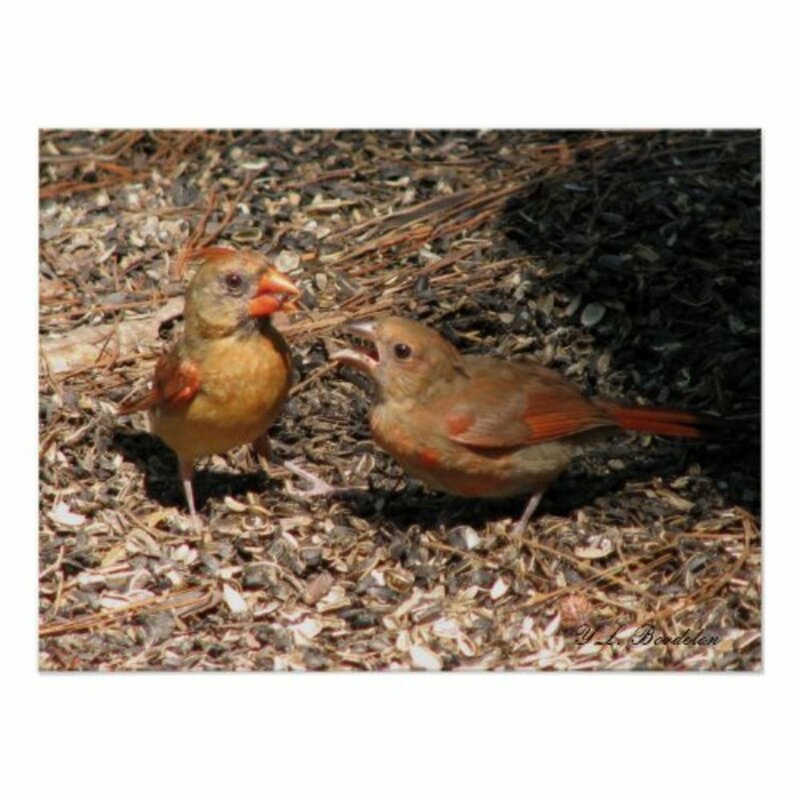 When the baby Cardinals leave the nest, they look almost "prehistoric," much too immature to be thought of as a fledged bird. They hide in bushes for the first few days and the parent (or parents) feeds them. The male Cardinal continues to feed the young even after they have grown almost as large as he is. This male was caring for a young female and a young male. The young male was already beginning to molt into his adult plumage. This year the Northern Cardinals have had many successful nests, so there are several immature ones at each sunflower seed feeder. Several of the pairs are on their third brood. 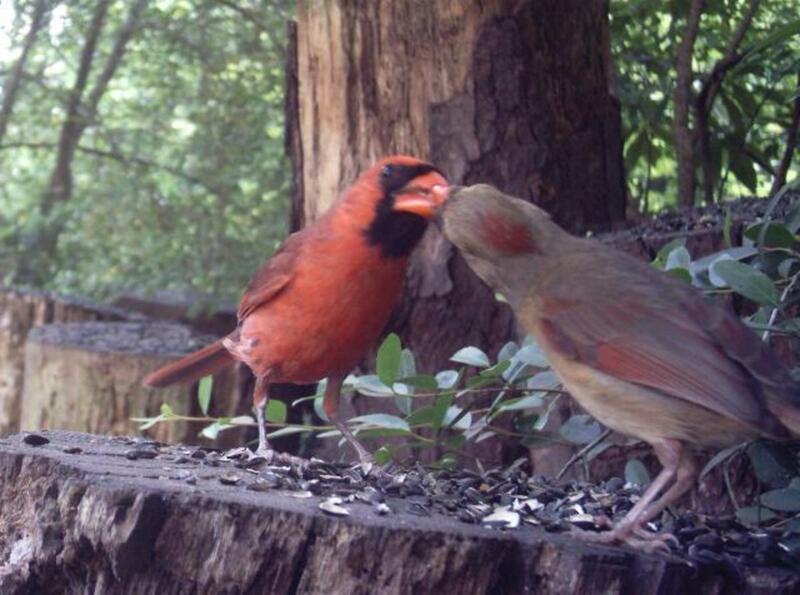 You can tell when Cardinals are on their last brood when you see both the adult male and the female feeding the young. On the first and second broods, the male feeds the fledglings while the female builds the nest, lays and incubates the eggs, and feeds the young while they are in the nest. 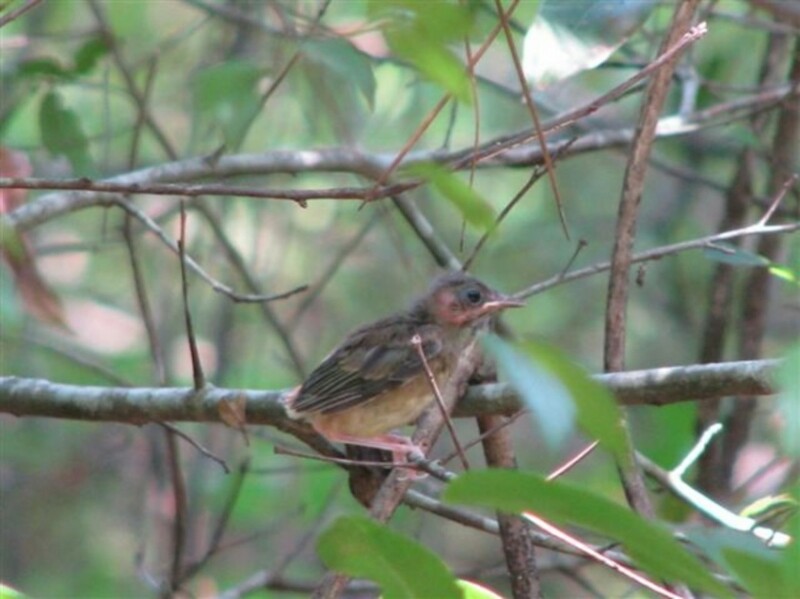 I was walking through the woods and this little bird flew from beside the trail. It was a young Northern Cardinal and probably had only been out of the nest for a couple of days. This fledgling looked so infantile, but it flew well, going from branch to branch with no trouble at all. The parents were chirping at me from the bushes, so they were taking good care of this baby. 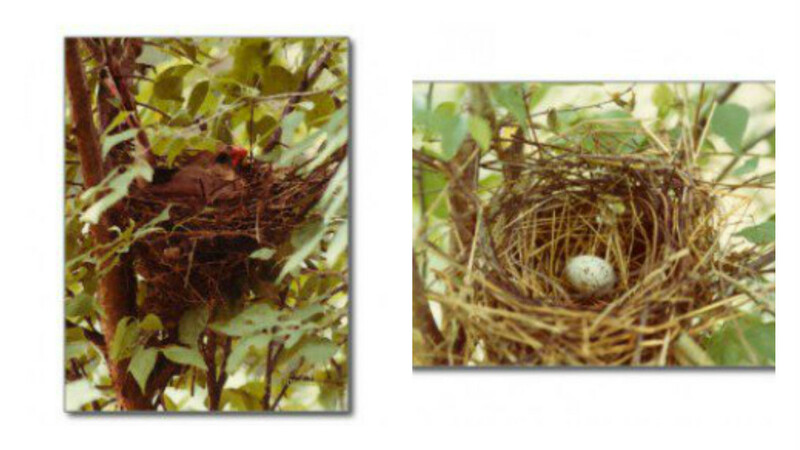 Do Northern Cardinals nest in your yard? Yes and I really enoy watching them. Yes but I rather they didn't. No. I live in the city. No. These birds are not native where I live. If another answer, please leave the explanation in the poll comments. This book has helped us identify many birds' nests that we have found in our nest boxes and in shrubs and trees on our property. The pictures and descriptions are excellent. You can't go wrong with a Peterson guide and this one is perfect for the amateur naturalist. Over 25 years ago, when we were young and foolish, we used to let our black cat, Zee, come in and out as he pleased. One night we heard a commotion outside our bedroom window and rushed out to find Zee Cat with a Mother Cardinal in his mouth. The nest was very low in the shrubs right by the window. There was one baby in the nest, so we brought it inside and kept it warm and safe. 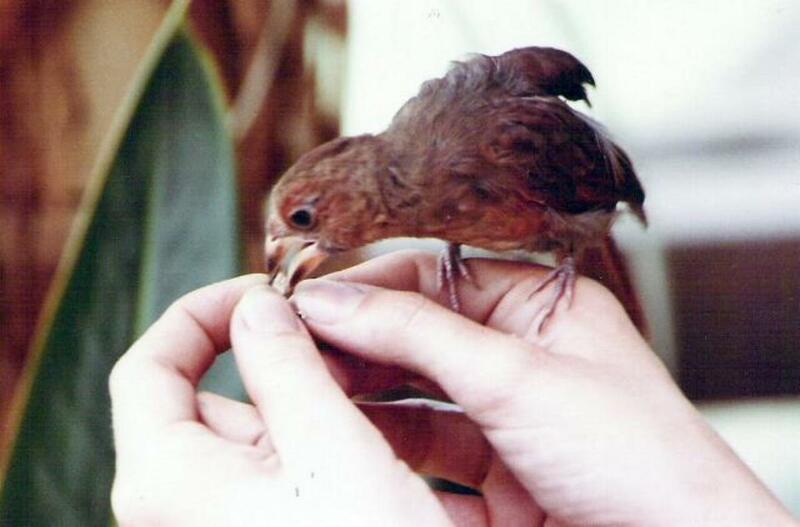 At that time, rehabilitators were few and hard to find. So since we had experience with hand-raising cockatiels and canaries and we had supplies on hand, we decided to raise the little guy ourselves. He grew quickly and soon began to show the mottled feathers of a young male. But we had to teach him how to open sunflower seeds like his bird parents would have. When he had molted into most of his adult plumage, we released him into the backyard. He stayed around for a while, then went off to establish his own territory. Ever since that incident, we have kept our cats inside during the breeding season and we only let them out on supervised excursions at other times of the year. Young male, first year. Notice the red feathers coming in. During summer and fall the young birds go through their first molt. The male and female colors (however mottled) begin to show and the dark beaks begin to turn orange. 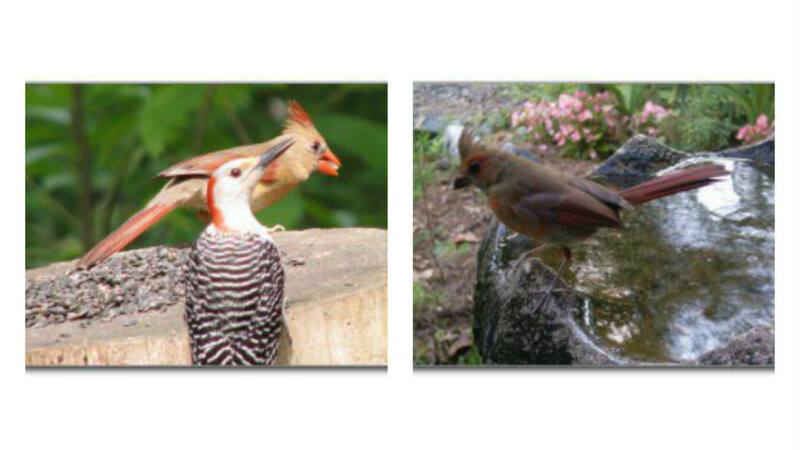 The first picture shows a young male, the second a young female. After the breeding season is over and the last of the young are able to feed themselves, the adults look a little ragged. They begin their fall molt, and by winter have a new set of feathers so that they will be well insulated against the cold weather. Winter Cardinals are bright, crisp and fresh looking. 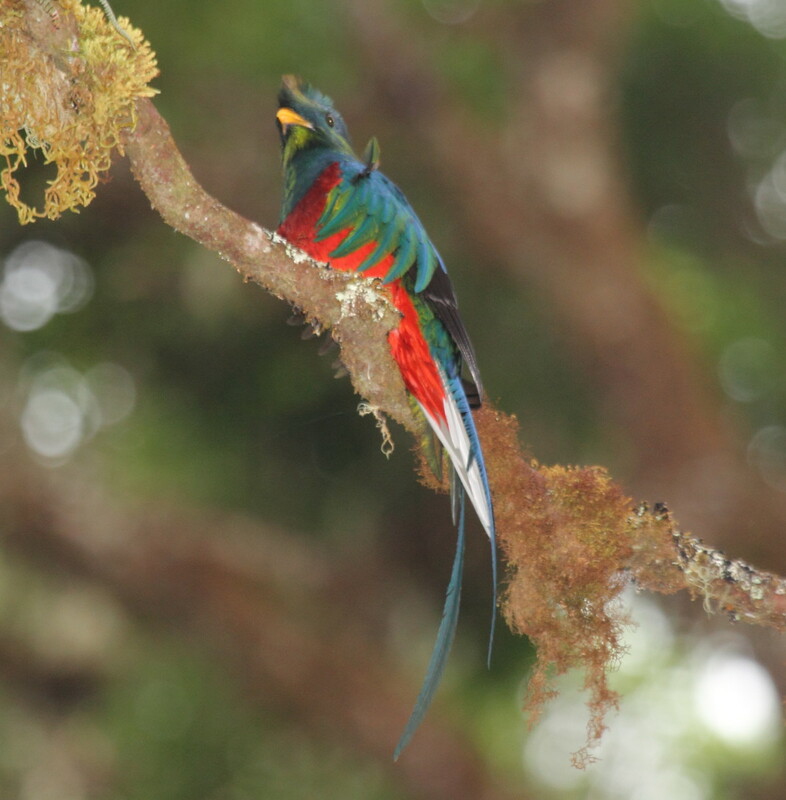 The male's beautiful colors help him establish a good territory in order to attract a prospective mate. In early spring the whole cycle begins again. Cardinals prefer shrubs and brambles. They love evergreen trees and these are especially good in winter to provide shelter from the cold. Besides being good for the birds, evergreens planted on the north side of your house will help save energy and lower your monthly bill. Food plants that Cardinals use include: Maple, devil's walking stick, paper mulberry, French mulberry, ironwood, bitter-sweet, hackberry, fringe tree, camphor tree, flowering dogwood, hawthorn, gumi, fatsia, common fig, ash, huckleberry, sunflower, firebush, lantana, privet, sweet gum, Southern magnolia, red mulberry, American hophornbeam, pokeberry, pine, black cherry, pyracantha, sumac, rose, blackberry and dewberry. A Cardinal's diet consists mainly of grain, but they also eat insects and fruit. Cardinals will readily eat from sunflower seed and suet feeders. They prefer platform type feeders, but will use hanging feeders that have large, sturdy perches. 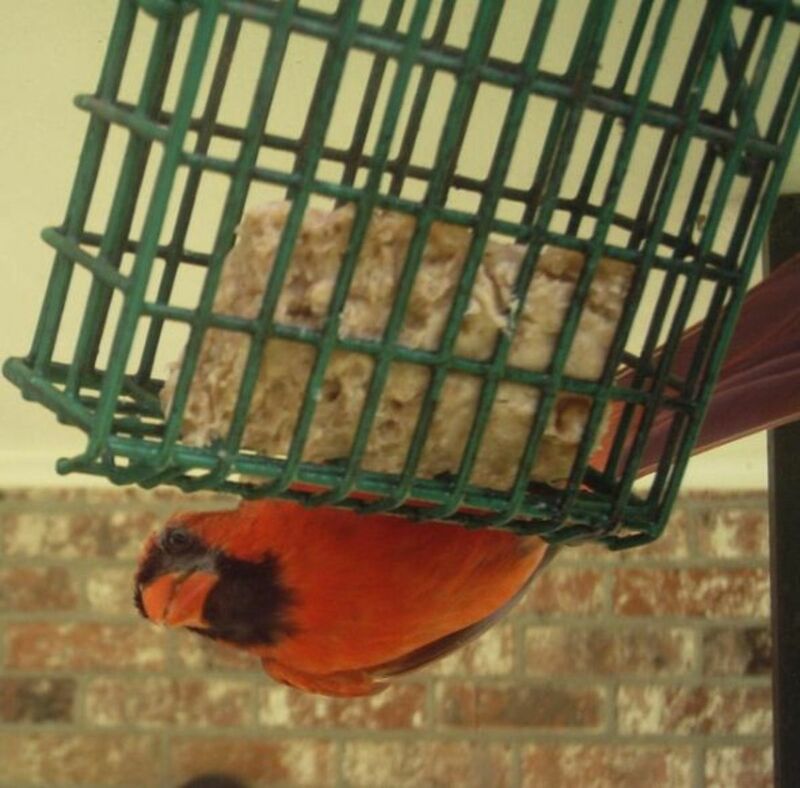 We feed straight black-oil sunflower seed, but special Cardinal mixes are also available. The Cardinals, Goldfinches, and most of the other seed-eating birds in our yard use the Brome Squirrel Buster feeder daily. The squirrels and raccoons have tried everything, but they can't get any seed out. Once, they broke the branch that it was hanging from, but only got a few kernels out. These feeders come in two versions: a hanging tube, like the one shown here, and a rectangular one which can be mounted on a pole. Every creature needs a water source. Cardinals will use standard bird baths, but they seem to like water on the ground more. They love sprinklers and misters. High-quality National Geographic book giving pointers and instructions about how to photograph birds. A young male pauses his begging for food until his father returns with a juicy morsel. If you'd like to learn more about the lives and behaviors of birds the Sibley Guide to Bird Life and Behaviour is an excellent book to read. This guide is a good companion to the Guide to Birds. We live on a lake. There are many cardinals, and we love them. Is the lake a good enough water source, or should I still provide a birdbath? The lake water is an excellent water source if it is not polluted. If you'd like to get a closer look at the birds bathing and drinking, then provide a birdbath. Do male and female cardinals share a nest during winter? Male and female cardinals usually begin to pair off during the winter in preparation for the spring breeding season, but once the young leave the nest, it is abandoned by both birds. The female builds a new nest for each brood. 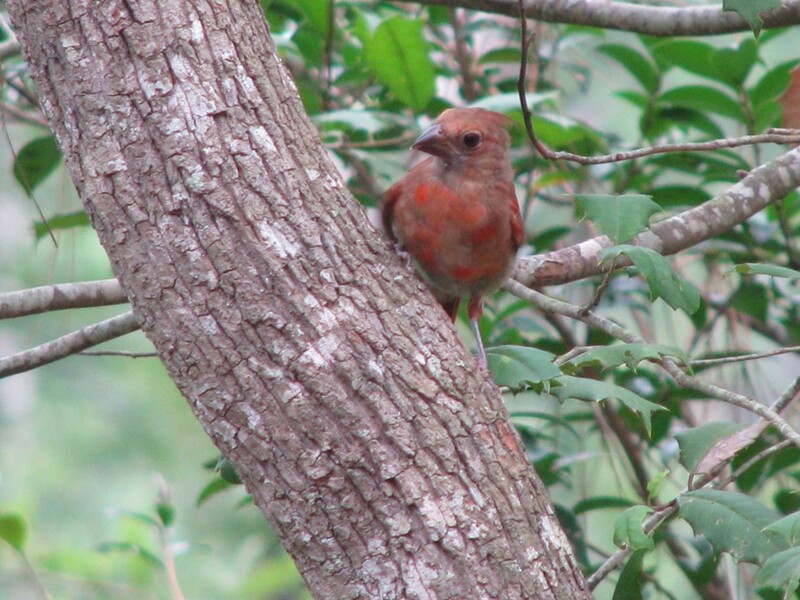 How can you tell if Cardinal fledglings are male or female? A few weeks after fledging, when the birds go through their first molt, young males will start to show red feathers in patches. Young females will molt to look like their mothers. My cardinal has hatched 5, yes, 5 babies in a tiny nest. Today is day 7 since hatching and this morning 3 were on the ground with mom & dad watching. 2 tiny ones are still in the nest. At only 7 days old will they be ok on the ground? If the 3 older ones that have left the nest have some feathers, are able to hop around and the parents are feeding them, then they should soon move to shelter in a bush nearby. If not, then you may want to put the 3 back in the nest with the other 2. The 2 tiny ones probably hatched last and may not be able to keep up with the older 3. It is unusual for all 5 to survive. A cardinal laid four eggs in a bush next to our house. Two eggs hatched. The babies grew up and left the nest. Two eggs did not hatch, and I haven't seen the mother in two days. Are the eggs "duds," so they won't hatch? Yes, the two remaining eggs will not hatch. This is not uncommon. 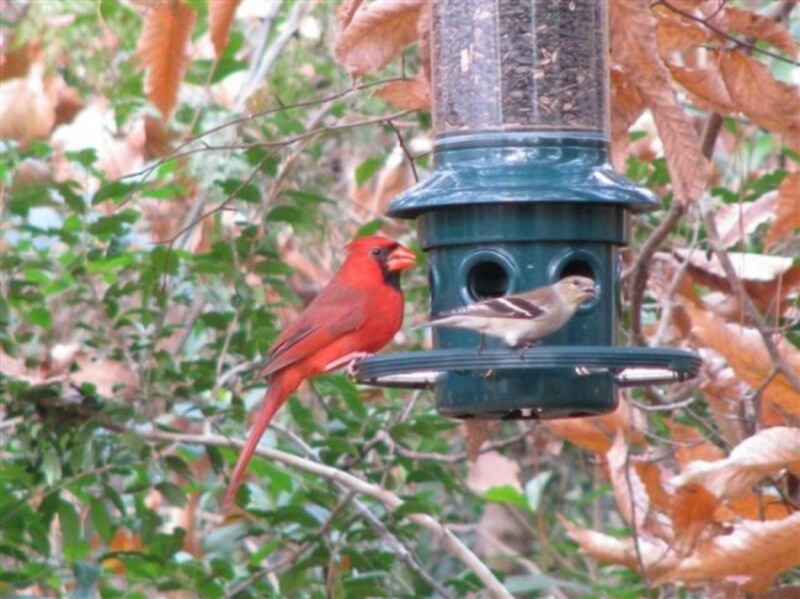 Other birds seem to eat most the food before Cardinals join in. They seem more shy & skittish. Is there a way to curb the other birds' feeding while giving the Cardinals more opportunities to feed? Cardinals feed early in the morning and late in the afternoon when it's almost dark and the other birds are not around. Try feeding safflower and sunflower seeds. Those will attract cardinals more. What happens to the eggshells after the babies hatch? We found a cardinal nest in a loropetalum bush by our pool. The mother laid five eggs in it. So far, four have hatched today. However, there are no eggshells in the nest. Do the birds eat them, or push them out? Most birds carry the broken egg shells away from the nest and drop them on the ground. This reduces the chance of predators finding the nest. While the babies are in the nest, the parents also carry away the "poop sacks" for the same reason. We had cardinals in our yard that built a nest and appeared to lay eggs. After a couple of weeks, they almost totally stopped coming back, so I got a ladder and peeked in, and there were three dead babies. What do you think happened? 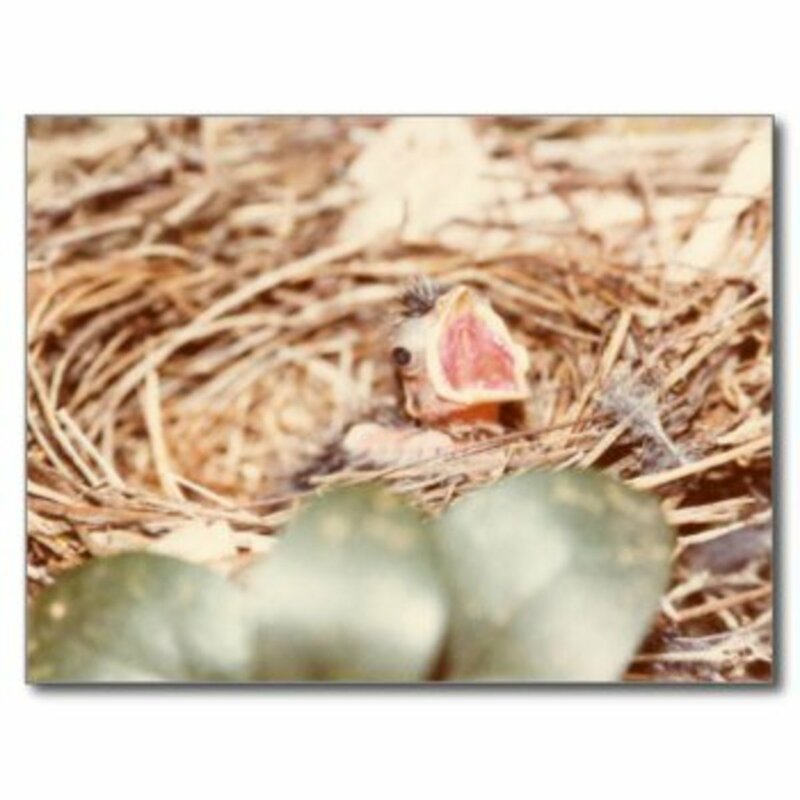 There are many things that could have caused the death of the chicks such as heat or other weather conditions, poisoned food, inexperienced parents, etc. Hopefully there's still enough time for the parents to rear another brood. I found a cardinal nest with a mom in the nest. The next day I took another peek, but the mom had flown away. I went to check if she came back and now there are just two blind chicks. Will the mom come back, or did I scare her off? The mom should be fine, but don't go close to the nest too often. Try using binoculars from a distance. We had a Cardinal build her nest in our open patio umbrella two days ago. I saw the dad watching on the fence nearby. So far there are no eggs, and it seems as though the mom and dad haven't been back in a day or so. Do we just need to be patient, or is it possible they abandoned this nest? Be patient. The female will begin laying if she feels the nest will be safe. If not then they will find another spot for a new nest. I exposed a cardinal nest with eggs while trimming some brush. I didn't know it was there. Now it has no protection from the afternoon sun. Can I or should I try to relocate it to a cooler, shadier spot nearby? I would try to put back some of the trimmed branches to shade and camoflauge the nest. I have a cardinal that has built her nest and laid her eggs in a shrub right by our back porch. I have two dogs that I have to let out to go potty that way, and she’ll fly out of the nest sometimes. Are we disturbing her? Hopefully, she’ll finish taking care of her eggs/babies? We (adults) stay away from the porch using the side door instead. She should be fine as long as you don't touch the nest. How did you teach the fledgling cardinal to open sunflower seeds? The cardinal sat on my finger while I opened the sunflower seeds for it. Pretty soon it figured out how to do it by himself. 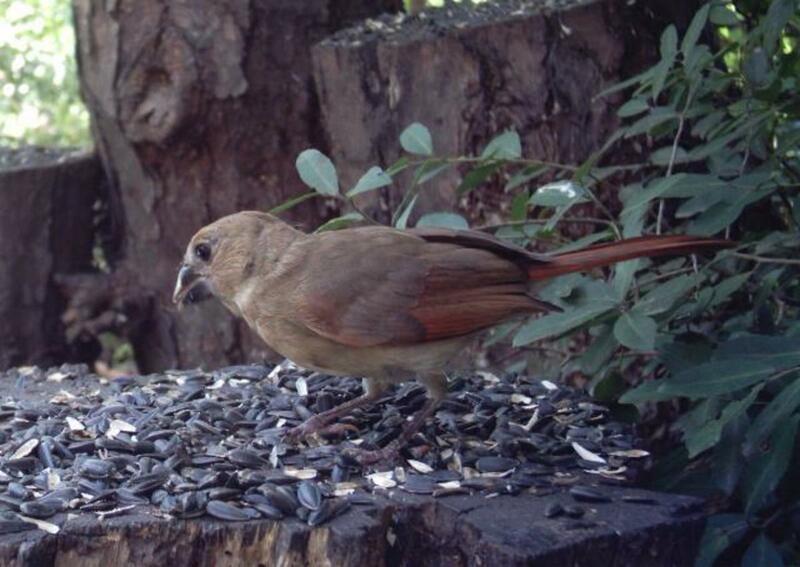 How long can the mother cardinal be away from the nest and the eggs still be ok? It depends on the weather. On warm days, the eggs and young won't get cold, so they can stay away for half an hour or more. On cold days, only a few minutes. As the chicks develop feathers, longer periods of time. How do I get cardinals to nest nearby so I can see their eggs/chicks? The best way to attract any bird to nest in your yard is to provide the proper habitat which has plants which provide food, shelter and nesting sites. Freshwater for bathing and drinking is essential. Bird baths or water gardens attract and sustain cardinals and are a great place to watch them. Feeding stations with sunflower and/or safflower seed will also attract them, especially in winter. In spring the parents often bring their babies to our feeders. Do cardinals ever use the same nest twice? The babies have been gone for about two weeks, and I would like to take the old nest out of the bush. This is probably the last nesting that the parents will do this year. In my experience cardinals do not reuse the same nest. They build a new one in another place because of predators. Removing the nest should be okay. My baby cardinals are ten-days-old. I went to check on them, and the nest is destroyed and I’m worried something got them. Could they just have relocated? It does sound like a something disturbed the nest. The young usually leave the nest at around two-weeks-old. Perhaps they were able to get away. If the babies did die, the parents should start a new nest soon. 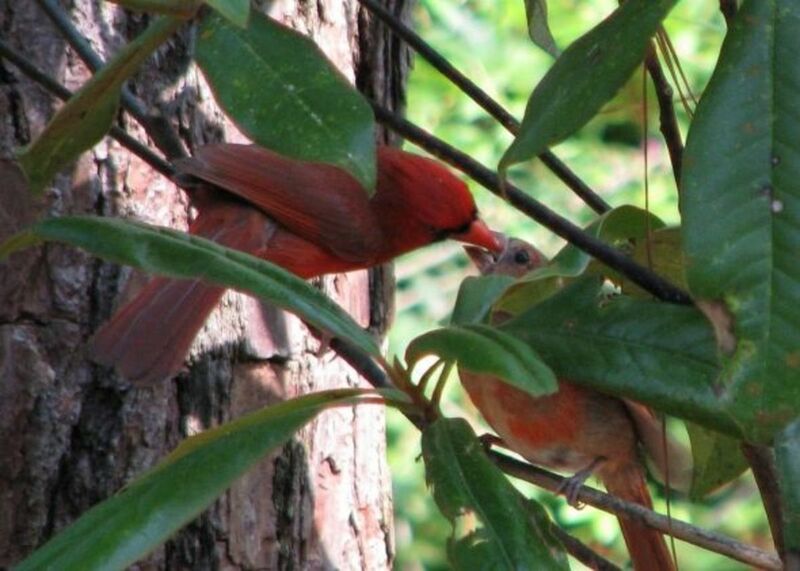 After a cardinal's babies have grown, do they stay in the area where they were born? 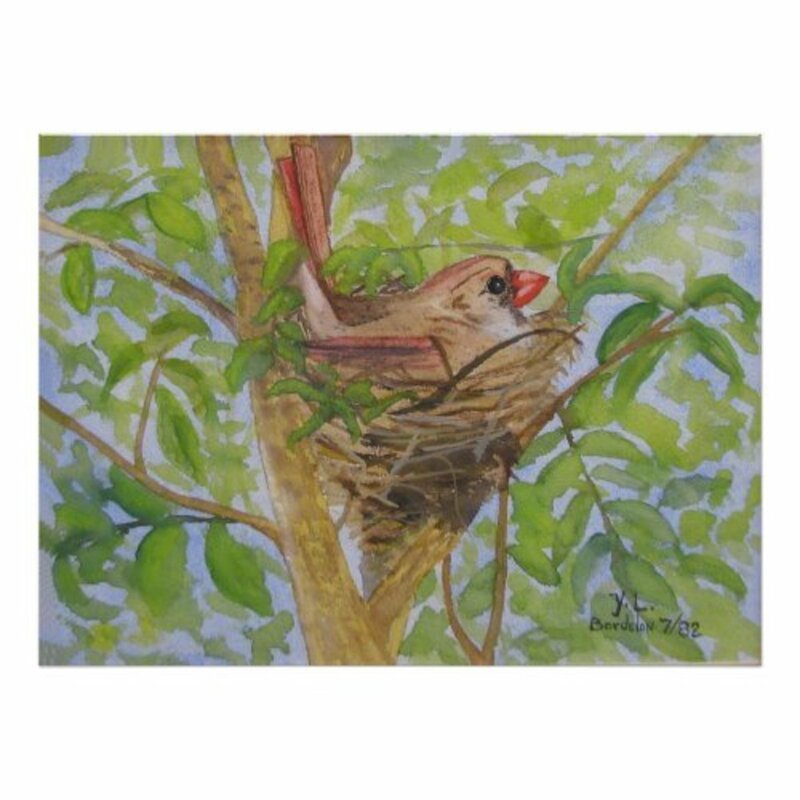 Yes, Cardinals often build their own nests not far away from where they were raised. Our cardinal is sitting in her nest with her beak open, almost as if she’s panting. I read above males feed females when mating, but I haven’t seen the male. Is she ok? She's probably hot. If there is water nearby, she should leave the nest for a drink and a bath to cool down when she feels the need. If this is their second nest, then the male is probably off taking care of the first batch of young. 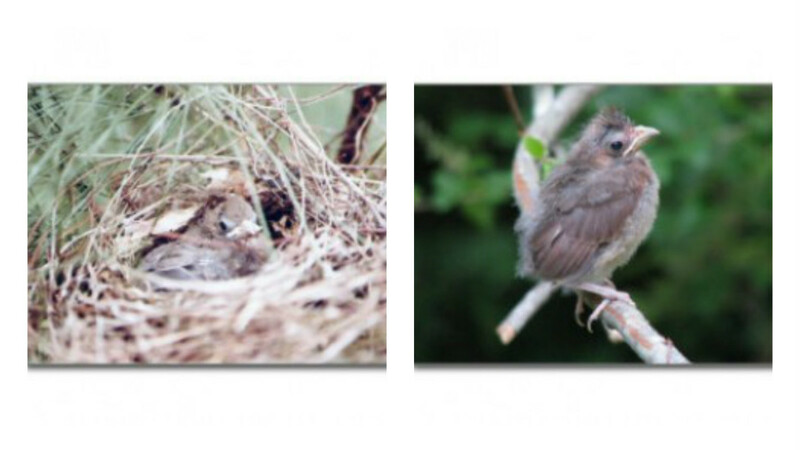 After baby cardinals are born, do they relocate to a new nest? 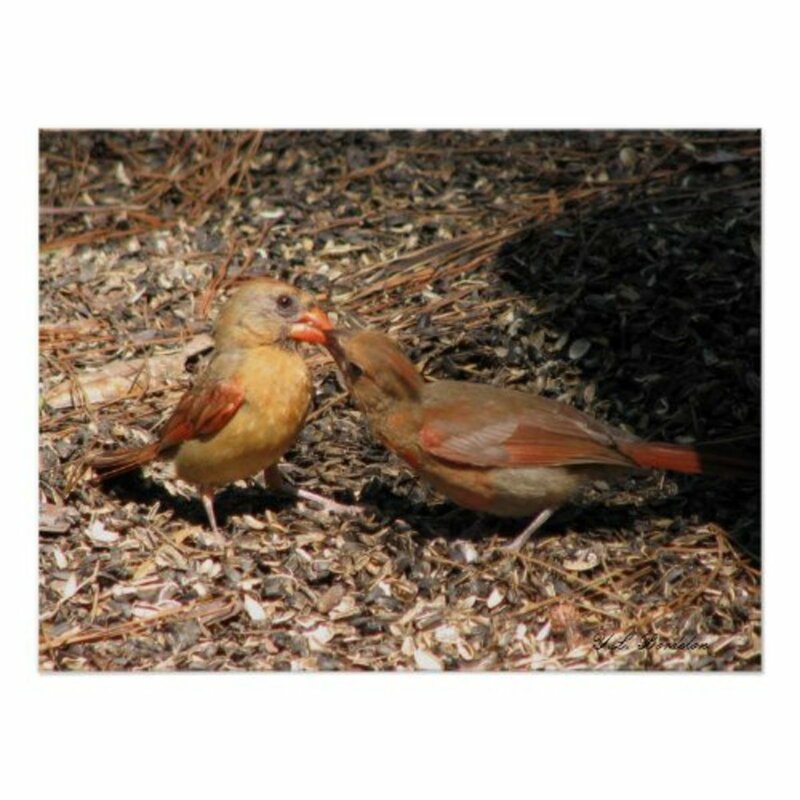 When the baby cardinals are a few weeks old, they leave the nest and go off with the parents who feed them and teach them how to fend for themselves. If this is an early nesting, the male will take care of the fledglings, and the female will build a new nest to lay more eggs. The first of four eggs hatched in a boxwood right by our driveway. All four chicks are alive. An hour ago, a terrible ruckus of birds took place. The chicks are fine, but the mom hasn’t been back. Papa is around but isn’t tending to them. I think it was a hawk that scared her off, but will the mother come back if she is ok? If the female is not injured, then she will probably come back. However, now that predators have discovered the nest the chances of success are slim. The babies are probably too young for the father to care for. It is possible to hand-raise them, but a rehabilitator best does this. Is it OK to ground a seven-day-old cardinal? 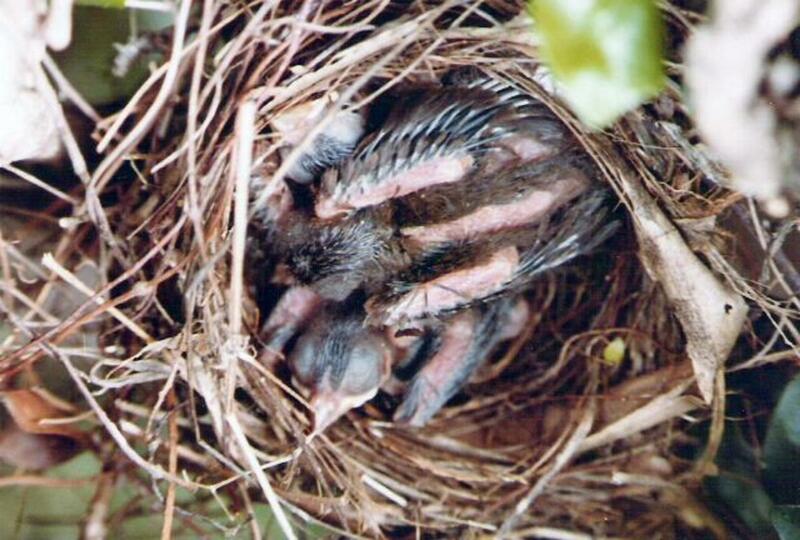 A seven-day-old cardinal is a little young to fledge. How do I get cardinals to nest nearby in my yard? Plant trees and shrubs which provide nesting sites, shelter and food. Put up a birdbath, fountain or water garden where it can be seen from the house. Keep cats inside, especially during breeding season. I’m worried that the cardinal parents have abandoned the nest. I’ve seen her nearby but haven’t actually seen her on the nest. The babies are a few days old. We had a lot of activity in the yard a day ago with a beehive, and I’m afraid they’ve been spooked. How long can the hatchlings survive? Hopefully, everything is fine. When the babies hatch, the female is often off of the nest searching for food. During the summer it is warm enough for here to leave the babies unattended for longer periods of time than when it's cooler as it is in spring. Are cardinals born or hatched? 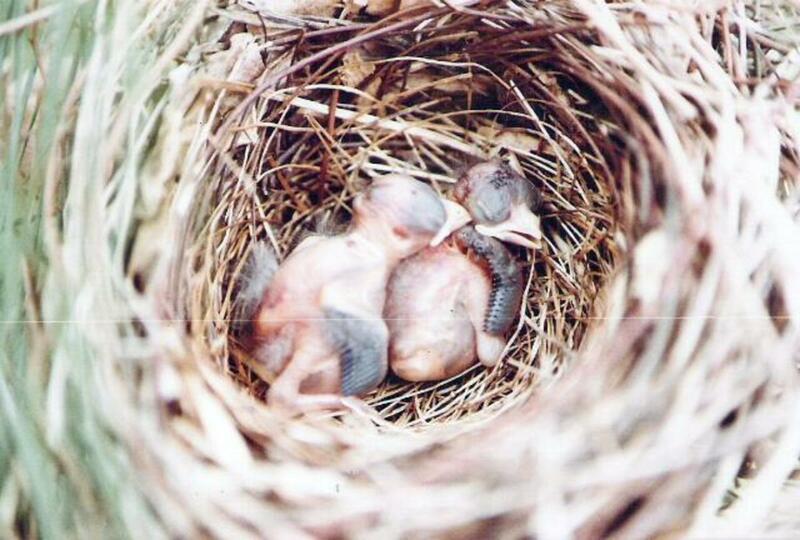 Cardinals hatch from an egg, as do other birds, but you could say a new life is born into this world. 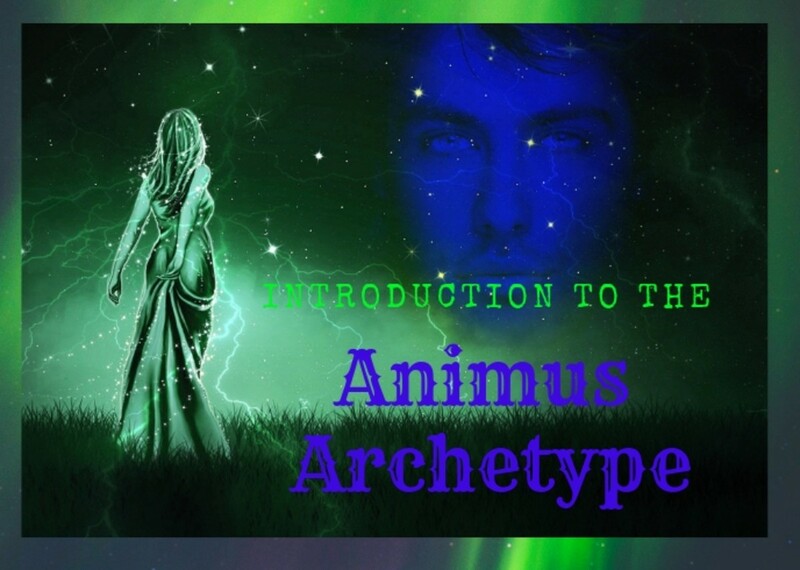 What Is the Jungian Animus Archetype? Tell us your Cardinal Stories. I have a young male who is hanging out by himself.. he has been her 4 days, trying to get in the house and now staying under my carport. By now (December) all parental links between mother and son should be finished. I would tend to think that the mature male and female are a pair and the young male may be viewed as a rival. This may also be food related. A second feeder wouldn't hurt. I have what looks like a young male cardinal with its mother. It has an injured eye and a more mature male is chasing it away. Should I set unother feeder further away? Do the male parents attack their offspring? Hopefully the mother will come back. Try to give it a wide berth for a while. The chicks should fledge in 10 days to 2 weeks. I found a cardinal nest in my portch umbrella but couldnt see inside of it. I went to move it and found 3 blind chicks inside so i promptly put it back. Will the mother return or have I just unwittingly killed those baby birds? I have watched a pair of cardinals raise a pair babies and here it is 6 weeks after the babies started to fly, they still hang out with their parents. I see them everyday at the feeding bowl together. What was funny, after they were big enough to fly, dad was still mouth feeding them seeds for a couple of weeks. After the young birds fledge, the parents continue to feed them for several weeks as they teach them to forage for themselves. They will be fully feathered with some adult plumage coming in before they can totally feed themselves. I was hiking in GA and came across a ~7 day old bird attacked by ants on a trail, I couldn't find nest so decided to give him a 2nd Chance. I raised cockatiels in 4-h and worked in parrot bird rehibilutation when I was a teenager. It's been 10 days, I have millet and seed in the cage and I would expect it to start picking, any advice? A cardinal built a nest in a flowering bush right outside my home office window. I was washing the window and had it tilted inside when I noticed my cat was sitting on the edge of my desk. She saw the nest before I did. I quickly closed the window so as not to frighten the female away. I closed the blind for the same reason. The cat soon lost interest since she couldn't see the nest any longer. I watched for several weeks and finally saw the last of the three babies on the edge of the nest. The male came and began to teach the baby to leave the nest. He would hop from branch to branch and the baby would follow. Eventually, the male flew away towards the feeders and the baby followed. I could not believe it. It was very exciting but I soon got depressed and realized truly what "the empty nest" means. I went through that emotion with my five children and then again with my nine grandchildren. Now the flight of the cardinals brought all those emotions back again!. A great experience. I hope I get to share it again with the male and female cardinals in my yard. Even my coffee mug has cardinals on it, so it was a dream come true to see them up so close that I could have touched them from the window, but of course I didn't. I gave them their safety and privacy. Mother Nature at her best in my yard! I exposed a cardinal nest with eggs, I didn't know existed, while trimming brush. Now the nest gets too much hot, direct sun exposure. Can I or should I try to move it to a cooler, shadier spot? I have two cardinals sharing a nest with 5 chicks in the nest. The females come to the nest alone and together. Have you seen this before? Will the 2rd and 3rd nests be close to the first nest? Same bush or maybe one next to it? 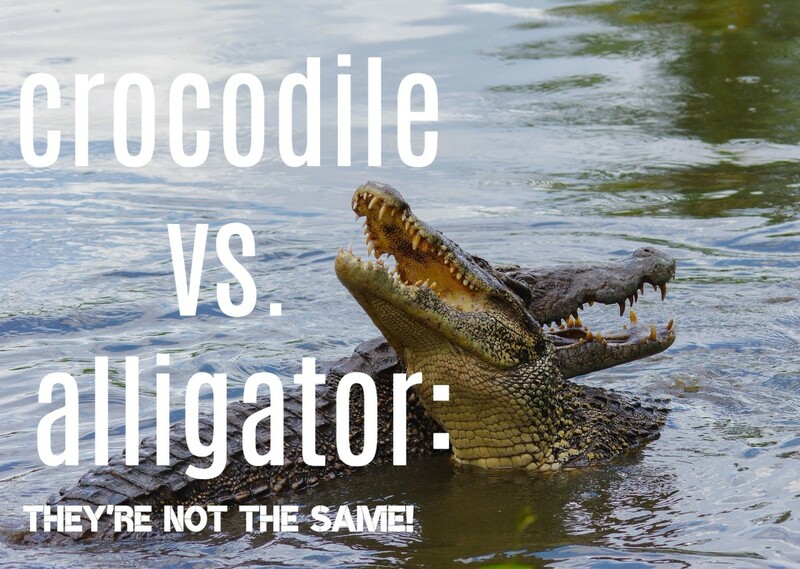 If the mother was not injured or killed, the baby may survive, but now that predators have discovered the nest, the parents may abandon it and build a new nest in another location. If you prune the bush, perhaps you could hold off on doing that until later in the spring. If you don't prune it, then I would think that this pair is probably building a second nest in a more secure location and hopefully rearing young there. I have a pair of Cardinals who nest every year in the same bush, right outside our dining room window. However, although I’ve seen the eggs, I never see the chicks hatch. I’m afraid something is stealing the eggs every year as they suddenly disappear shortly after being laid. Is there any way to help protect them? We don’t have a cat, but in South Florida, we have iguana and lizards galore. A female cardinal built a nest in a fern hanging on my back porch. She has been sitting in it for several days. Today I saw two baby birds on the porch floor below the nest, and the mother and father birds have been flying around the porch. I picked up the one bird that was still moving and put it back in the nest. The other one was not moving so I threw it away. Could the baby I put back in the nest survive? i have about three my life sadly.i am writing a report about them.by them i mean the northern cardinal.i have to show my class at fergus falls MN PWLC.i hope they like it!!!!!! I watched a mating pair build a nest about 4 days ago in my backyard. However, I just went out to check on the nest and it was empty. Not sure if she laid her eggs as the nest is too high for me to look from above. I last saw the male early morning but do not see the female. Will the female leave the nest after it is built? Hoping she didn’t feel threatened by my vocal Caique. My two dogs also roam as they please in our backyard. I had a cardinal nest in my rose bush. So far all the normal activity I have read about has occured. 3 eggs were laid and mom finally started incubating. She would be in the nest on and off. We had a really bad storm but she never left the nest. As I recall I feel like she sat in the nest as much as she did previously maybe a bit more, but that night was the last I saw her. Today marks 3 days without seeing her. What could have happened? Could she possibly come back? Are the eggs still viable? Did we possibly scare her off? We have tried to be very careful not to disturb her. I have been unable to find how long females can stay away from their nests during the incubation stage. 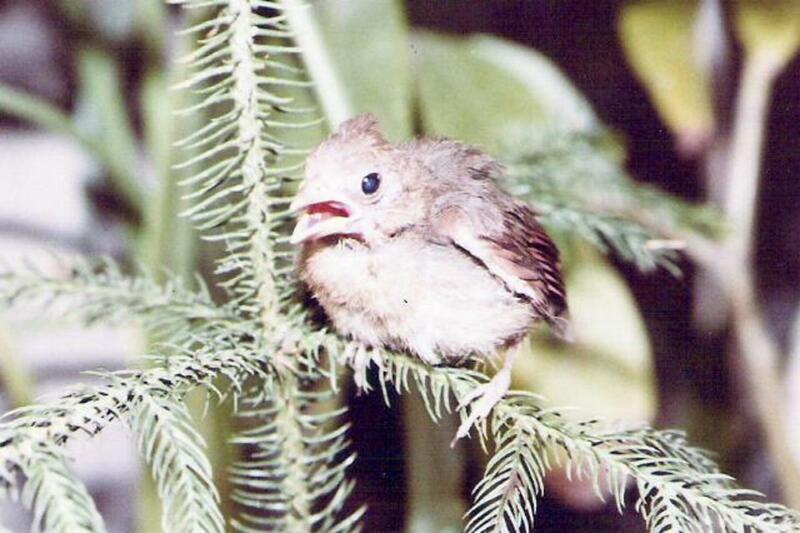 I like baby Cardinals because I am learning a lot about the cardinal's. they are cute. Add Your Comment..our cardinals come back every year and build their nest in our hibiscus tree on our deck(except for last year - the robins got there first). They arrived today and started to build their nest. This is our fourth year waiting and watching the babies grow and fly off. We actually saw them flying around looking for our tree. We put it outside and they arrived. Nature is magical. I have never seen a Cardinal use last year's nest. In fact they usually build a new nest for the 2nd and 3rd broods of the year. That way it is more difficult for predators to find the nest. Cannot find info re cardinals coming back to use a nest made in the previous year. I don't think a few outside Christmas lights would disturb them. This time of year they are not nesting. 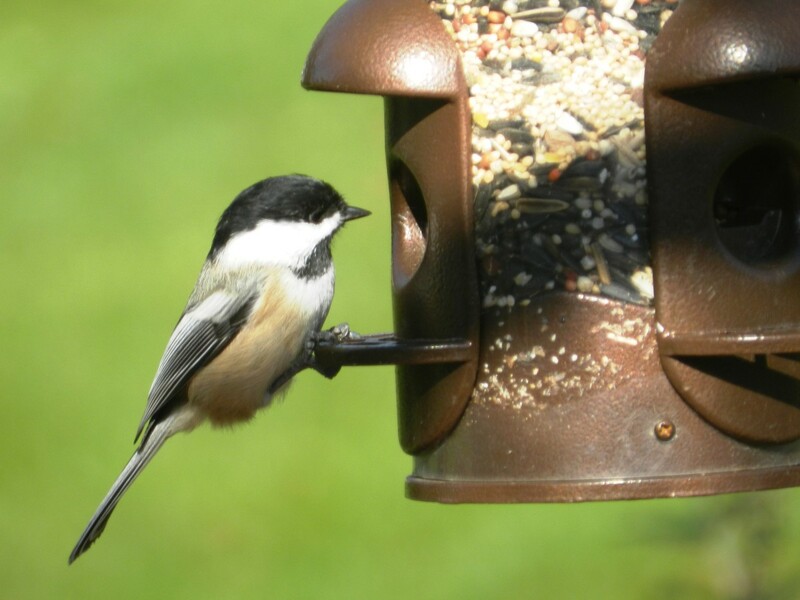 Putting out some suet cakes or sunflower or safflower seeds would help them get through the winter and would invite them to stick around your place. I have many cardinal families living in my yard year round and making nests everywhere. I would like to put some outside Christmas light out this year but do no want the cardinals to leave. Any suggestions? Cardinal birds built a nest in our Crepe Myrtle and hatched 3 babies. The tree is right next to our kitchen window where we had great viewing at the inside of the tree and the nest. After a while, the male noticed us watching them and he came to the window and cocked his head and looked, but then went about his business. I was surprised to see him feed the chicks as well as Mom bird. A month and a half later, one of the male babies came back to the tree and sat on a branch near the nest inside the tree, preening his feathers and taking a snooze. Was wondering if the babies typically will return to same tree they were born in? I am surrounded with birds but not a single cardinal. Great lens, I love to watch Cardinals out my window, just a few feet from my computer. Thank you for publishing this lens. I look forward to getting a feeder that will keep the squirrels out of it. The cardinal is a beautiful bird - one of my favorites. You've done it some justice here with this lovely lens. I came here researching information for my book (it's a novel but I mention the cardinal) and I got everything I need and much more! What a beautifully made lens, loads of stunning photos, and love the youtube vid with sound of cardinal's song! Nice lens about a beautiful bird! Interestingly, female cardinals will also sing and I have witnessed this on several occasions in the spring. I have had the "pleasure" of banding many Northern cardinals and they are notorious for having a painful bite -- no doubt about the seed-cracking strength of those bills! Thanks for sharing, great lens. Absolutely beautiful lens. I love watching the cardinals and blue jays in my yard. Thanks for sharing. I love the lens, especially the pictures. 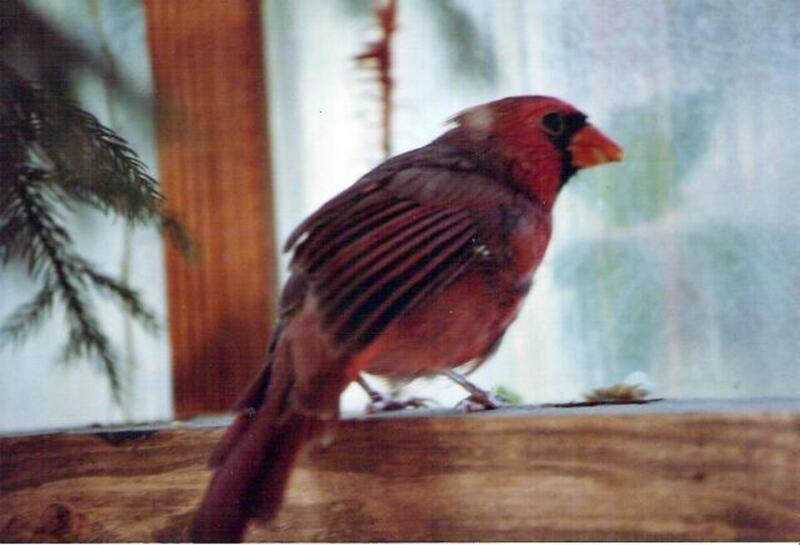 There is a Cardinal that flies into the window outside of our home each day. There something about that window. Nice lens. Love your lens, have some building a nest in a tree right outside the door right now! Excellent &amp; informative lens! I didn't know much of the details of their mating brooding. A wonderful tribute to Cardinals. Thank you for publishing this lens about these beautiful birds. Wonderful! Cardinals are my favorite birds. Thanks for a deeper look into their lives. Wow, what a great lens! 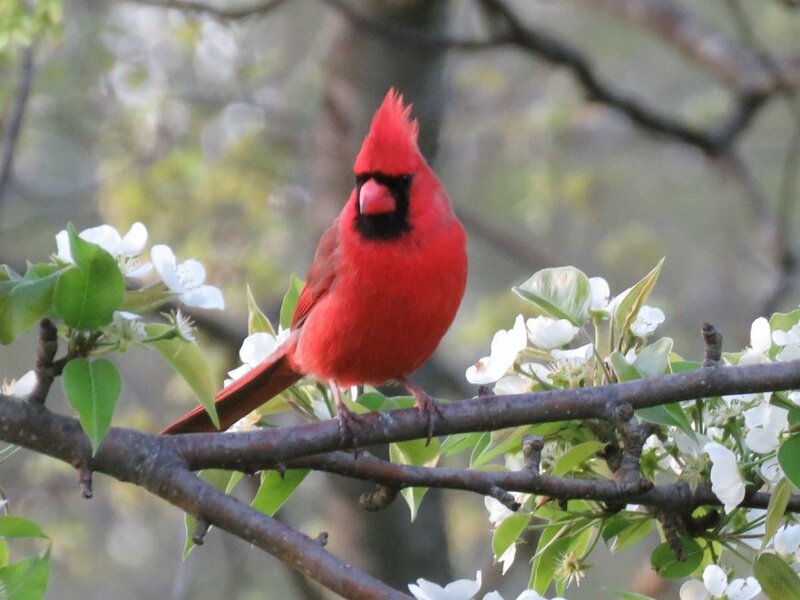 Cardinals are plentiful on our property, and their sounds are indeed beautiful. The flashes of color, especially in the winter, are magical. I would always be thrilled as a kid in Canada when I would see a cardinal, which was not very often. Beautiful lens. Great lens, thanks for all the work behind pulling this information together. Blessings. learned a lot about cardinals from this lens. thumbs up! We have cardinals in the Okanagan Valley for part of the summer. I've never seen them building a nest but I love to hear them sing. Beautiful lens and very informative. Angel blessing! Great lens, I love it and cardinals too! Thank you! This is one of the beautiful lenses I have seen. Good info, too. Very nice lens. I don't have any stories about Cardinal. Great lens with a lot of useful information. Cardinals are beautiful, and it was wonderful reading more about them. Lots of great information. Terrific lens! Great lens. I adore cardinals, they come often around my yard in Florida. Great info. I have been looking for bird feeders idea that would keep the squirrels away because they seem to eat most of the bird food. @anonymous: As a rule is not legal to keep a Northern Cardinal or any other native bird as a pet, but special licenses and permits can be obtained by people who rehabilitate wildlife. Also, in the case of nests, abandoned eggs and such, similar permits can be issued to individuals by state agencies. @anonymous: (May have responded on wrong page a moment ago.) Per Federal Law, governed by the U.S. Fish &amp; Wildlife Agency, personal ownership is not legal of even a mere feather from a bluejay. Check with that Agency for verification, but I am fairly certain ownership of wild songbirds is unlawful. I do not anything about the State Law in Florida, but have been aware that by Federal Law (U.S. Fish and Wildlife Service being regulatory Agency in question) it is not legal to own a mere feather from a bluejay (for example). Check with those folks. Am fairly certain this is not legal...to own any wild songbird. But I am not the expert, ask the appropriate Agency. 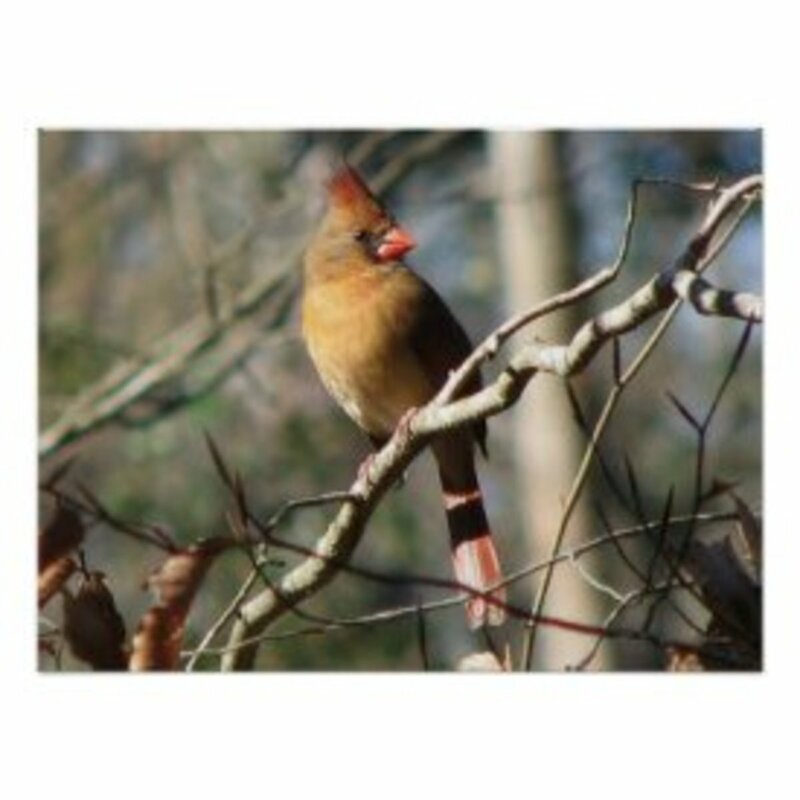 Can a person keep a Red Cardinal legally as a pet in the State of Florida? Hello, is it possible i saw Cardinal bird in Grand Canaria Islands? Im almost sure its almost the same, like its on the picture. Lovely lens! I'm going to have to visit the Eastern part of the US so that I can see (and photograph) cardinals. Thank you for this lens. Nice lens! I especially enjoyed the videos. Absolutely beautifully done, I enjoyed every moment of my visit....well, maybe not the part about mamma Robin. 90% in your quiz, missed the number of brood when I went with 3-4. I so enjoyed listening to the Cardinal's song, it reminded me of home. Its always a special treat to see Cardinals and lucky you got to even raise one! Great lense about Cardinals, I enjoyed reading it very much. I wish we had them to visit our feeder, but I guess we live to close to the marsh, and they would rather be nearer to the woods. A very interesting lens. I enjoyed read it, thank you. This is my favorite bird, great lens. Really enjoyed this lens. 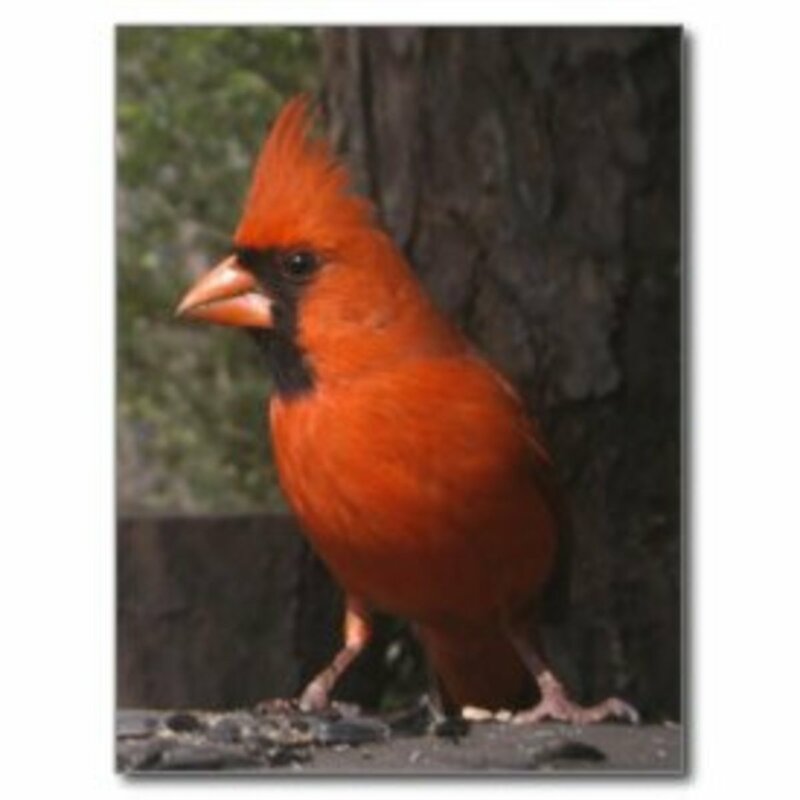 I grew up in NE Texas and loved to see cardinals. Now I live in the west, and I miss them. Loved your pitchers of raising the adorable and goofy little hatchling. Nice lens. We have had cardinals nest in our trees several times. It is fun to watch them grow. Really enjoyed this lens. I love cardinals and really miss them. 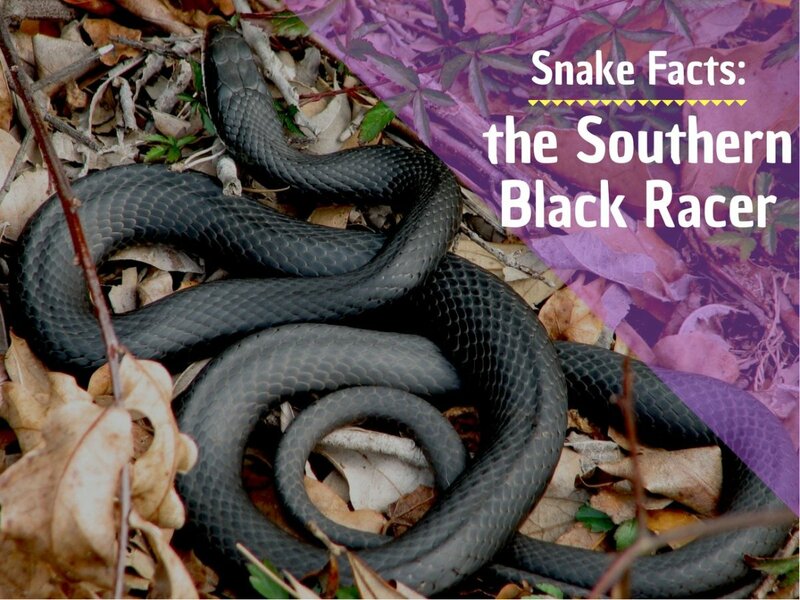 Had them on my nature sanctuary in Texas, but do not have them here at my mountain home. They are such a favorite of mine. Lots of info on cardinals. My husband and I just love those birds so much. I have lots of redbirds here in Alabama. I love watching the cardinals raising their chicks every year. The daddies are so attentive.We are surrounded by woods so they are prolific here. I definitely notice that their size is larger and their red color is brighter when they have plenty of black oil sunflower. What a lot of work went into building this great Lens, thank you for sharing this with us! One day we had about a dozen male cardinals in a small space. I love birds ever since I know myself. I feed them every winter. I'm watching a Cardinal in my backyard right now..so I stopped back by to give this a blessing and add it to my December Blessings lens. There are no cardinals where I live, but I so enjoy seeing them whenever I travel to other parts of the country where they live. Great photos and information. Blessed by a SquidAngel. Awesome lens! Love my cardinals! @Tyla MacAllister: Your place sounds a lot like ours. Thanks for reminding me of the beauty that surrounds us. We haven't been able to get outside and enjoy it lately. I never get tired of watching cardinals. The daddies are such wonderful parents. I think it's great that you actually raised one by hand. This year the weather was warm in October so we had our last babies in the yard just before Halloween. It is the only time of year you see the fledglings with their mothers instead of just dad. 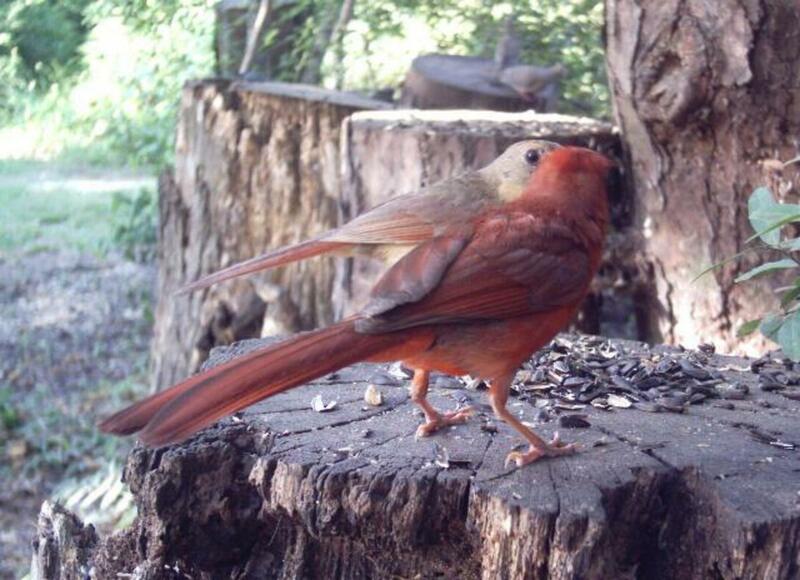 My home is surrounded by woods that have been left in their natural state and the cardinals really thrive in our yard. It's hard to have a bad day when you wake up to Christmas trees every day of the year. Beautiful Birds in a beautiful layout - featured on my lens on 'Bird Watching Wiki"
I love watching "my" cardinals and am a bit protective of them, making sure they have fresh water in the winter and grains. They've repaid me by sticking around for the last 5 years, and many times I can see them on bushes just a few feet from my living room windows. This truly is an awesome page, and I'd love to have a bit more land for a nature preserve too! We always have cardinals at our bird feeders and often can hear the males singing loudly up in the trees in our neighborhood. I especially love them in winter when they sit in our evergreen hedge and their bright colors look so gorgeous. @anonymous: I'm sorry to hear about the window kill. The male's behavior probably is unrelated. Apparently your windows are reflecting like mirrors. Males will often "fight" with their reflections, thinking it is a rival male. You may want to put a windsock or a sun catcher on the outside of the window to help break up the reflection.